On an edition of SportsCenter Wednesday afternoon, Rob Parker and Keith Law had a debate about the AL MVP award. I can't find any video online to share the ridiculousness, but essentially, Law provided rational arguments arguing for Mike Trout while Parker took a page from the Skip Bayless book and made his point in favor of Miguel Cabrera by being loud. After the debate, Parker took to Twitter and brought out the nemesis of statisticians everywhere… nerd jokes. Only this time, they fell flatter than a pancake. To all the stat-geeks that follow @keithlaw: please put ur calculators down and watch the damn game. That's why the A's haven't won jack. The Oakland A's are currently three games out of the AL West lead, and are a playoff team in the AL as the second wild card. They have five more wins than the Detroit Tigers. Explain this to me: when talking about NFL quarterbacks, why does ESPN trot out QBR when *no one* can calculate it without inputting every little bit of data from a game into a computer? Why is PER such a great meter of a player's success level in the NBA when it's nearly the same thing as WAR, which is apparently a demon stat created by nerds in their parents' basements? It's one of those mysteries of the world…. baseball advanced stats get savaged, while advanced stats in other sports get praised by ESPN and mainstream media. I think a player like Mike Trout, who brings value to the team on defense, the basepathes, and on offense, is a pretty valuable player to have in center field when trying to win a World Series, no? I've watched that Billy Beane movie 20 times and the A's never won the World Series. Stats so lame, they couldn't add a Hollywood-ending. First off, we've finally found the person that pumped up Moneyball's gate receipts so much. Secondly, there was a book that came out nearly a decade ago (that, get this, the movie was based on!) that explained the Moneyball concept a lot better than a two hour Hollywood movie ever could. Moneyball isn't about winning the World Series. It's about exploiting market ineffciencies to create a regular season contender on a low budget. Just like in every series, it's a matter of getting hot for a month. The Phillies won 102 games last season and were eliminated in the NLDS by a team that didn't get into the playoffs until the last day of the regular season. It happens. And that's how Parker finishes up…with more terrible nerd jokes! The depth of his commentary and insight is striking. Let's review: an ESPN pundit, who proudly states in his Twitter bio that he is a regular on First Take and a show called NUMBERS NEVER LIE hates statistics and belittles and bullies anyone who uses things like math, numbers, logic, and reason. This is actually happening. Rob Parker must be so confused. Rob Parker isn't a baseball writer, or fan for that matter. He's a troll, who gets paid by ESPN to yell about whatever the hot topic of the day is, no matter what show he's on. When he has no valid analysis or point to make, he mindlessly shouts "NERDS!" to anyone within earshot. I can't wait until he attempts to define Miguel Cabrera's candidacy for MVP with the Triple Crown… which is determined via statistics. Batting average, home runs, and RBI are statistics, just like every stat being used in favor of Trout's candidacy. 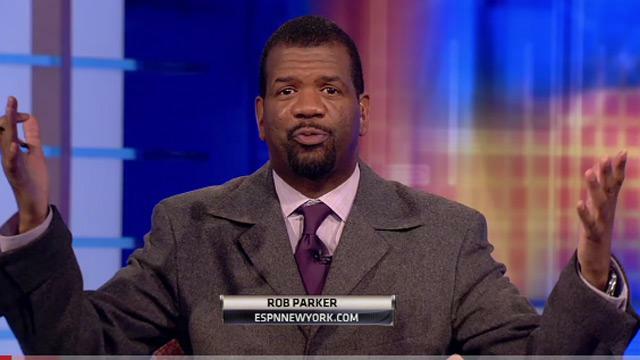 Simply put, Rob Parker is everything wrong with ESPN and sports media today.